Based on the Sega Saturn console, the Sega Titan Video, for every game but Sport Fishing 2, uses ROM carts instead of CD-ROMs. 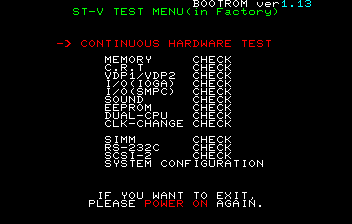 By holding down the Service Mode switch and powering on the cabinet, the BIOS enters an "in Factory" ST-V test menu. 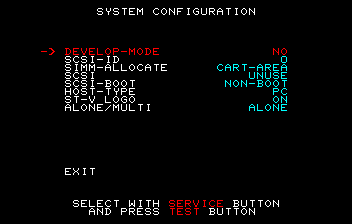 While much like the normal test menu, here there are additional options for receiving data via SIMM and SCSI ports as well as setting the machine to be in "CART-DEV" "DEVELOP-MODE". 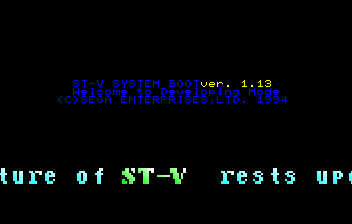 In this mode, after restarting the machine, it waits for receiving data via these ports as well as showing a scrolling message along the bottom: "The future of ST-V rests upon our work and your work." Within every ST-V game at 0x6ED, and in the BIOS at 0x77ED is the string "SHANG SHANG TYPHOON", in reference to the band of the same name. It is currently unknown if this is used as copy-protection. 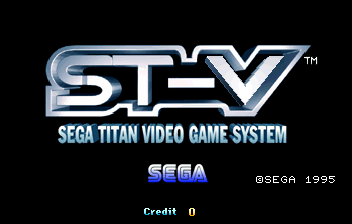 Leftovers from the Sega Saturn BIOS can be found at 0x7F316 and 0x74534. This page was last modified on 18 December 2017, at 00:03.